Nicki Minaj is ready for her summer takeover. We haven't seen the Head Barb hit a stage since before she went into hiding back in December. But, she's back. And with a vengence. The Young Money rapper jetted to Miami for a surprise performance during rapper Future's set during the 2018 Rolling Loud Festival. The forecast wasn't working in their favor. It was raining, but that wasn't going to stop the show. Dressed in a black and white Dior top and bottom with Chanel boots, hat and poncho, the self-proclaimed Harajuku Barbie surfaced on stage as the intro to her new single "Chun Li" blasted through the speakers. It was her first time performing the track live. 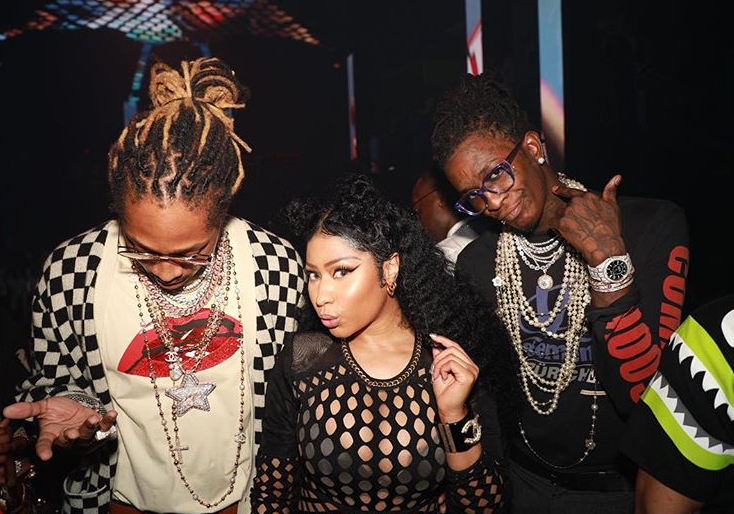 After the show, Nicki linked up with Future and Young Thug (atop) to party it up at LIV nightclub in Miami. Nicki Minaj has been tapped as the musical performer for "SNL's" season finale, hosted by actress Tina Fey, that will air this Saturday, May 19th. As expected, the NYC raptress will perform her new musical offerings. On social media, the "Barbie Tingz" rapper announced she will be working with Tina Fey on a new movie titled, Get Ya Life Ugly. Not only that, Nicki's long awaited fourth-studio album, QUEEN, is slated to hit the streets on June 15th. She's also set to return on the "Ellen DeGeneres" show for an interview and to perform. Looks like Nicki is working overtime since making her comeback. NEXT: DJ Khaled & Kendrick Lamar Lead 2018 BET Awards Nominations, Album Of The Year Category Is TOUGH!